WELCOME TO THE EUROPEAN QUIZZING CHAMPIONSHIPS 2019! We are delighted to welcome you to the European Quizzing Championships and very much hope that you will be able to join us in Sofia from the 8th to the 10th of November. This year, the specialist subject quizzes are Business or Performing Arts , and Geography or Television. Our hotel is the Park Hotel Moskva which looks out over a park across the city. Hotel rooms are very reasonably priced, with a single room at 37 euros including breakfast, and 47 euros for a double room including breakfast. 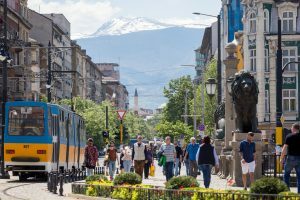 Along with the quiz events, we have also arranged some optional excursions to Sofia city centre, two UNESCO World Heritage sites – Boyana Church and the Rila Monastery, one of the oldest cities in Europe – Plovdiv, and Istanbul spanning Europe and Asia.